We are interested in two processes fundamental to eukaryotic cellular life: mitosis and membrane trafficking. 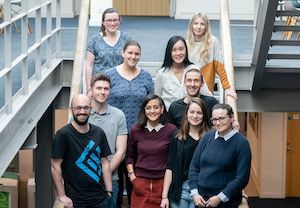 We want to understand how these processes operate at the molecular level in the hope of identifying new strategies to prevent tumour formation and propagation in cancer and to inhibit cellular infection. Click on the links to find out more about our work and about the people in the lab. You can meet all the people in the lab by heading to the people section. Cansu found some trouble with GFP nanobodies! Erick and Steve applied the Tammes Problem to intracellular vesicles. Nick made a new tag for correlative light-electron microscopy called FerriTag. We worked with Richard Bayliss's group and others to examine how clathrin binds to TACC3 after its phosphorylation by Aurora-A kinase. Laura came up with a way to make cells do endocytosis on-demand. Sourav worked out that FGFR3-TACC3 gene fusions in cancer cells hoover up TACC3 from the spindle causing mitotic problems.